AT&T approves BlackBerry Bridge for PlayBook | BlackBerry Blast! AT&T has finally decided to allow BlackBerry PlayBook users to connect to their BlackBerry for the full PlayBook experience. 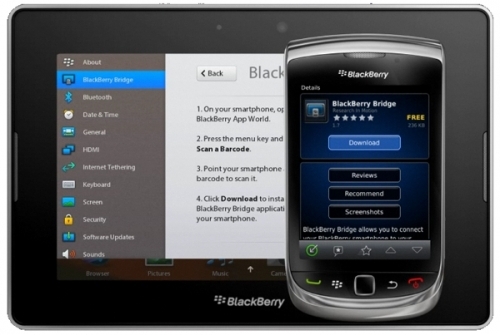 The company has enabled the Bridge software that is required for pairing the PlayBook with a BlackBerry. I guess it's better late than never right? Users can now access the information on their BlackBerry from their PlayBook. Those looking to tether though will require a tethering plan. Hi all, Andrey here with an important BlackBerry� Bridge� update. I�m happy to share the news that the BlackBerry Bridge app is now available to AT&T� customers! The app will appear in the BlackBerry App World� catalogue throughout the day, but you can get it right away by searching for �BlackBerry Bridge� within BlackBerry App World. For those not familiar with the BlackBerry Bridge app, it mirrors the existing messages, contacts, calendar, memopad, tasks, and BlackBerry� Messenger (BBM�) that appear on your BlackBerry smartphone. For example, through BlackBerry Bridge, you can use your BlackBerry PlayBook tablet to respond to an email that was received on your BlackBerry smartphone or send a picture to a BBM contact. Pretty cool! Head on over to the BlackBerry App World to pick up your copy of the BlackBerry Bridge.